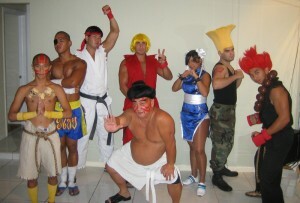 Street Fighter Cosplay, Street Fighter Chun Li cosplay, Chun Li is a very hot role in cosplay world. Chun-Li is a character in the Street Fighter series which is a video game produced by Capcom. She is the first female playable character to appear in a 1-on-1 fighting game. Hun-Li was the only female and the youngest character in the game, described in Street Fighter II, while not as physically powerful as the other characters; she was by far the quickest. Her most famous attack is the Hyakuretsukyaku, where she repeatedly kicks her opponent from a tilted standing position with incredible speed. Chun-Li’s name is Mandarin, Chun means spring, Li means beautiful, so her name means she is a single young girl filled with the beauty of spring. Older official sources from the early 90s indicate Chung was Chun-Li’s surname, although it is worth noting this could very well not be the case anymore. In the live-action Street Fighter movie, Chun-Li was given the surname Zang/Xiang, but Capcom has not officially recognized it. Chun-Li’s cosplay costume has differed several times in the Street Fighter series, as well as in official art and cameos she has made in other works. She is known for her very muscular thighs. She is 5 feet 6 1/2 inches according to her Street Fighter Alpha 3 biography. Chun-Li‘s cosplay costume is a Qipao, a Chinese dress imported over from Manchuria, yet popular among girls during the early 20th century. 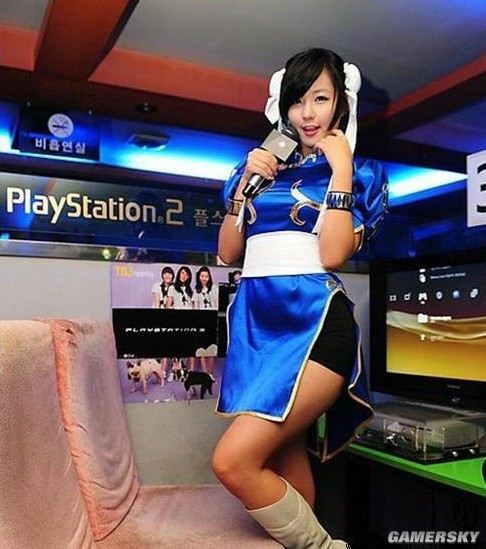 Her cosplay costume is modified to allow a far wider range of movement than a normal Qipao. 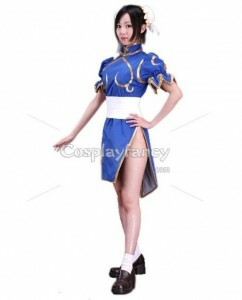 She also wears white combat boots and blue leotard with dark brown sheer pantyhose with her Qipao. Her Qipao is blue with golden accents. She was originally supposed to wear a peach-colored Qipao, as seen in her in-game profile and ending in the original Street Fighter II. Her hairstyle is called “ox horns”, a typical style in which Chinese children dress their hair; depictions of girls in Chinese paintings frequently show girls in ox horns. During the Alpha series, she chose to wear them unadorned, while in the remaining games, she uses silk brocades and ribbons to cover them, colored white to signify the mourning of her father. These silk brocades and ribbons that cover them are sometimes called bao. In Street Fighter 4, when wearing her alternate costume, she wears her ox horns unadorned, just like in her Alpha appearance, only this time it’s held by red ropes with golden balls at the tip. Chun-Li is generally a cheerful woman. She is often happy and excited when she wins a fight, mainly with her friends. As part of police Interpol she takes her job very seriously and will try her best to complete a mission. When it comes to fighting Chun-Li tends to get quite competitive with other female fighters, but after her fights with a few of them she becomes allies with them and possibly become friends. Chun Li is a so hot role in game; many people want to cosplay her. We have taught Chun Li, cosplay her is not hard. You can buy cosplay costume in online store; it is cheap but good quality.